Grand Duchy of Litva (Belarus). The town is first mentioned in the Chronicles of 1128. Grodno was the capital of an independent principality until 1398, when it was included in the Grand Duchy of Litva. Following the death of Gedimin in 1341, his grandson Vitaut, duke of Grodno, ascended to the Lithuanian throne, in the result Grodno became the second capital city of Litva. In 1410 Vitaut the Great mustered troops in Grodno for a decisive battle with the Teutonic Order which later became known as the Grunwald Battle. Grodno raced into the era of rapid development after the Grunwald triumph. Back in 1391 Wladyslaw II Jagiello bestowed the town with certain privileges from the Magdeburg Rights and in 1440 the town got a full-fledged right for self-governance. 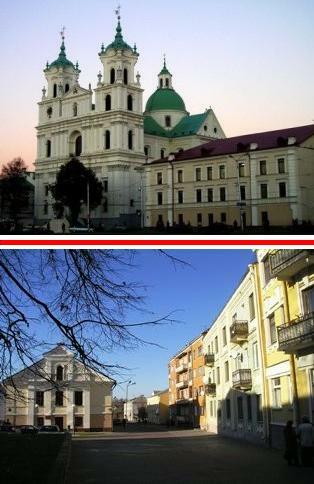 Nowadays the regional capital of western Belarus, Hrodna, used to be among the most important cities of the Polish-Lithuanian Commonwealth. In the late XVI century and the XVIII century it was one of the de facto capitals of the Commonwealth, where the country’s Sejms, the parliament sessions, were held. The Polish king and the Grand Duke of Lithuania, Stefan Batory, loved the city and chose it as his royal residence. In those times the country was called Litva (Lithuania), Land of Litvins. The name Belarus and Belarusians appeared later. In 1764 the king’s lands in western Belarus were given in possession of Grodno headman Antoniy Tyzengauz who immediately initiated a project to construct an “ideal” town in the suburbs of Grodno. This period became known as a time of prosperity for the residents of the town. The town-planning ensemble in the suburbs of Grodno is one of the earliest and most significant examples of large-scale construction in the history of architecture. Some 20 manufactures were inaugurated in Grodno and its suburbs including gold-weaving, silk-weaving manufactures, production of linen, furniture, glass, tobacco, metal and leather goods and arms. In 1775-1781 a medical academy was functioning in Grodno which jump-started and spearheaded the entire medical education in Belarus. The academy was led by French botanist and doctor Jan Emmanuel Giliber. There was a royal botanic garden near the academy which numbered about two thousand plants. A theater school was opened in Grodno, obstetrical courses, veterinarian courses, a school of accountants, builders, a nature museum and a military school appeared in the town on the Neman. In 1769-1780 a theater of Antoniy Tyzengauz was functioning in the town. Those times left their trace in Hrodna in the shape of numerous landmarks, some of them of international importance. The 12th century Kalozskaya church was recommended for inclusion on the UNESCO World Heritage list.